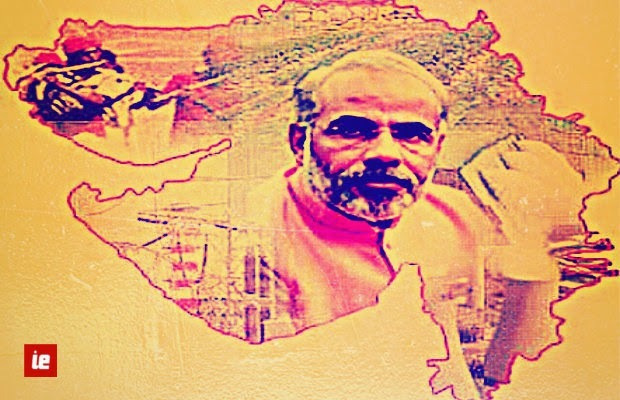 Tired of those rhetorical questions about Gujarat’s growth model? Well, for all those skeptics here’s something in quantifiable terms. It’s an unbiased view of Gujarat’s economic development compared to other states. The aim of this post is not to present Gujarat at the top of the roster on every socio economic parameter, rather it only shows that Gujarat is among the top three or four states in most parameters and the only states that consistently figures among the top in every parameter. 1. As per latest data available in planning commission website, the increase in employment in manufacturing sector in Gujarat for the period 2004-05 to 2009-10 was second highest in Gujarat among the large states, after west Bengal. To put it in context, during the same period, growth of employment in the manufacturing sector for developed states like Maharashtra, Andhra Pradesh, Tamil Nadu and Punjab was negative. So, Gujarat saw a flurry of migrant laborers from various parts of the country and positioned itself as a leading manufacturing hub. 2. Not just manufacturing. According to the same report, Gujarat has witnessed the 3rd highest growth in employment, in all non-agricultural sectors combined after Rajasthan and Bihar during the five year period. Again developed states like Maharashtra witnessed a negative growth in employment in non-agri sector for the same period. 3. Goa, Punjab and Gujarat are top 3 states in India by per capita electricity consumption. While Punjab and Goa are much smaller states Gujarat has highest per capita consumption of electricity among larger states. Gujarat is, as of August 2011, the only state with surplus power among states with population of more than six crores. Nearly 100% of Gujarat’s 18,000 villages have been claimed to have electricity connection for 24-hr, through the Jyotigram Yojana. 4. Gujarat has second highest per capita gross capital formation among the biggest states after Tamil Nadu. To put it in context Gujarat’s per capita capital formation is 20 times that of Bihar and ahead of developed states like Maharashtra and even smaller developed states like Delhi. Capital formation consists of outlays on additions to the fixed assets of the economy plus net changes in the level of inventories. Fixed assets include land improvements, plant, machinery, and equipment purchases; and the construction of roads, railways, and the like, including schools, offices, hospitals, private residential dwellings, and commercial and industrial buildings. In other words, Gujarat is ahead of its peers in adding fixed asset to its economy on a per capita basis. 5. Gujarat has the highest number of ports in India handling 37% of total Indian port cargo. The success story of ports in Gujarat is due to the participation of private players. For example, Mundra Port, a newly developed minor port in the state of Gujarat registered cargo traffic, higher than that of many major ports in 2008. Hence, the policy of Gujarat government to give private port license has paid of handsomely over the past few years. 6. As per reports published by TRAI in 2012, Gujarat’s wireless phone connection per capita is third highest in the country following Tamil Nadu and Karnataka. 7. Gujarat has second highest agricultural growth rate, after Bihar, among states with comparative size and population. Other states with high agricultural growth are- Assam, Chhattigarh, Madhya Pradesh, Manipur, Puducherry and Tripura. The data taken was average of 2005 to 2012, as per planning commission website. 8. In Gujarat, around the Gulf of Kutch, the night sky is illuminated by the world’s largest oil refinery, handling 80 per cent of India’s oil imports. 9. Gujarat has maximum area covered under SEZ’s among all states. This justifies to certain extent the tremendous growth in employment in the manufacturing sector, when other states were grappling with the issues of industrial land for setting up industries. 10. Gujarat has 3rd highest per capita income after Tamil Nadu and Andhra Pradesh among states with population of more than 6 crores. While per capita income may not reflect a true picture of inclusive growth, this figure read along with employment growth figures in point 1 & 2 above shows that GDP growth in Gujarat has actually translated into employment. The other two states mentioned here had a negative employment growth during 2004-09. 11. Gujarat has 3rd highest female literacy rate for females above 7 years of age, among large states, marginally behind Maharashtra and Tamil Nadu and miles ahead of Andhra Pradesh, Uttar Pradesh and Bihar. 12. Urban areas in Gujarat are leading urban areas of other large states when it comes to access to safe drinking water. 97% Gujaratis have access to safe drinking water, only behind Uttar Pradesh at 97.9% as per planning commission figures. This is, in spite of the fact that Gujrat is a semi-arid region and have lesser rivers and other fresh water sources compared to hinterlands of northern India. 13. Gujarat is among the only 4 large states with real growth rate (average from 2004 to 2010) in two digits, others being Tamil Nadu, Bihar and Maharashtra. 14. According to National Crime Records Bureau statistics, Incidence Of Total Cognizable Crimes (IPC) averaged over 2007-11 was lowest for Gujarat, among all larger states. There are more such indicators which shows Gujarat’s success story vis-à-vis other large states. I’ll keep posting it under my blogs. Please post your comments and suggestions to improve this article. **The comparison is mostly restricted to large states with more than 6 crore of population to present it in right context.